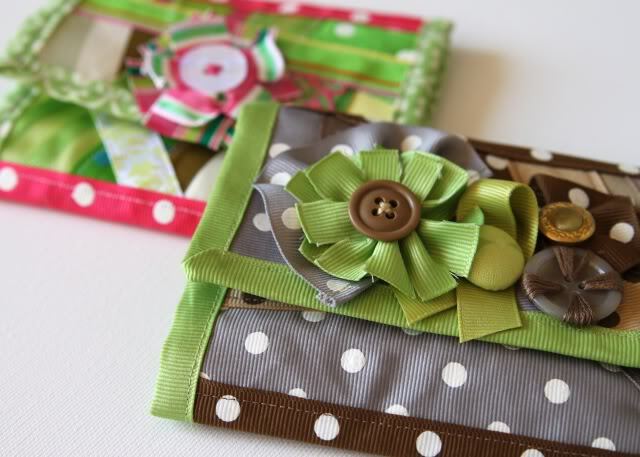 Lil Blue Boo has a cute tutorial for a Scrap Ribbon Wallet...you can use up all those left over ribbons that are too small for much else. 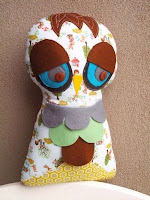 Robert Kaufmann have the cutest pillow with what else but an owl on it....so cute!!! 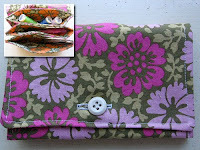 Nicole from Nickels Pickles has a fabric sewing box tutorial to take a look at. It is in German but she has an English PDF to download for us non German speaking people. Thanks Nicole! Mrs Moen has a tutorial to make a lovely village table-runner. I really like this and love the effect of the black fabric with white spots she has used to get a snowy look. 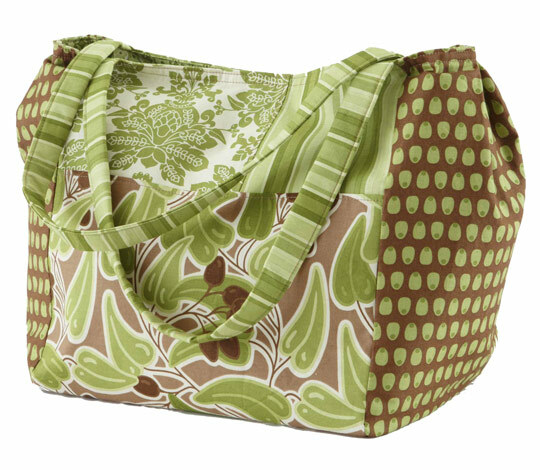 Martha Stewart has a free pattern to make an oilcloth lunch bag. This is what I am planning on making very soon. 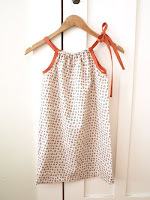 What a clever idea Refashion has come up with to whip up an easy dress for a little girl. She has used a pillowcase to make this lovely little dress. Of course you could just use fabric too but there are so many cute pillowcases that are fairly cheap to buy that it would make a nice cheap dress too. 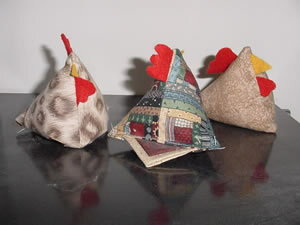 Quilting Works has a pattern for a chicken pincushion. I know we have probably seen these around before but until I got one similar sent to me by my friend Marilyn I dint realise how cute they really were...take a look at mine here. Living Creatively has this cute little purse to keep your sewing bits and bobs in....I think I would use for money purse though too. 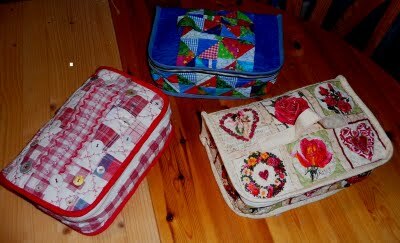 Studio efabrics had got a great range of free patterns....a couple of nice hand bags that I really like, quilts, pincushions and other goodies to try your hand at. 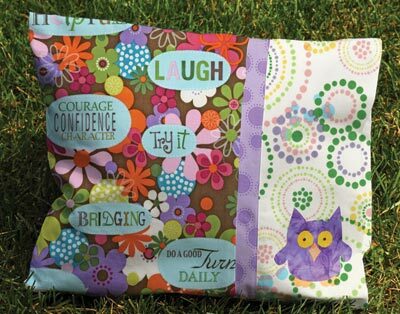 Flower Shower from Michael Miller Fabrics....this is nice and funky. There are a heap of nice ones on the main pattern page here. Michael Miller have a free owl quilt pattern called 13 Owls for all the owl lovers. 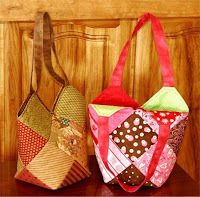 All People Quilt have also got a great pattern for a Large Patchwork Bag. 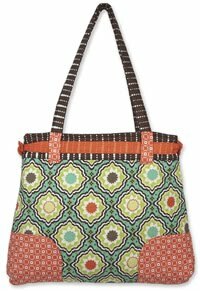 Love the fabrics they have used on this bag. 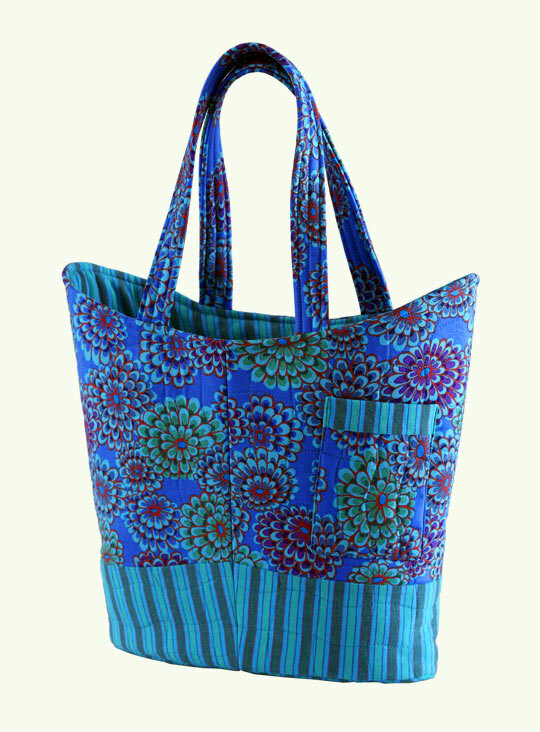 All People Quilt have a nice quilted tote bag pattern. I like this one because its a bit different in shape and looks firm and stands nicely on its own. 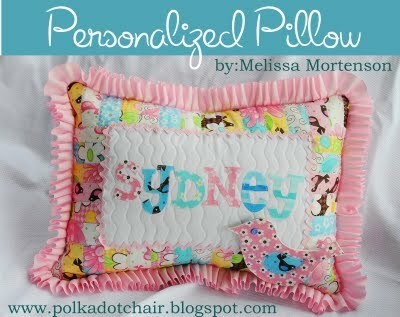 The Moda Bake Shop has a cute tutorial to make a personalised pillow. I actually really love this fabric range. It is so sweet. 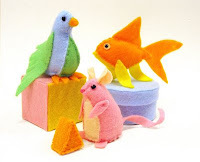 Fantastic Toys Blog has a cut tutorial for Cat Toy Plushies....but I myself wouldn't give them to the cat to play with....they are just too cute. A fish, bird and mouse. 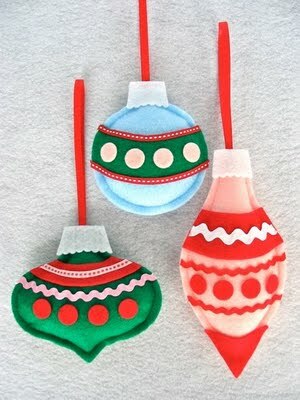 Fantastic Toys blog has a cute pattern for felt Christmas ornaments that would be easy to sew by hand or machine. 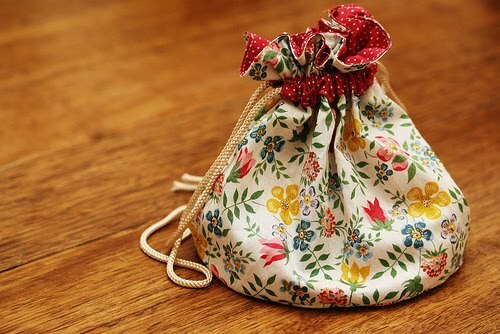 Penelope Waits has a simple way to make a little drawstring bag she calls her Little Bag of Secrets. Day 4 for the Christmas Blog Hop is with Pat Sloan who has created a lovely Zig Zap Pillow.....I am liking all these ladies creations so far. 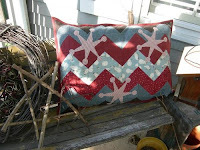 Allison from Strandz has a quick quilt to whip up called Crazy Four Patch. 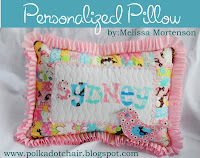 I think this would be easy enough to get done without too my drama for even me...LOL...she also has another quilt that looks very effective and yet again easy enough for me to whip up called Whirligigs or Wonky Pinwheels....thanks for sharing with us Allison. Day 3 of the Christmas Blog Hop is Terry Atkinson who has a cute tutorial for "Molten Chocolate Cake Mug" which is a gooey chocolate cake that bakes right in the mug! You'll make a super simple bag and fill it with the dry ingredients for the cake. Terry has supplied details for a tag with the baking instructions to put into the mug so your receiver can bake the cake. The second day for the Blog Hop brings a really cute table mat by Sandy Gervais over at Pieces From My Heart. I really love her stuff. And when you go over to her blog take a look at the OWL. OMG I need one of those....just gorgeous. Life in the Craft Lane with Mandie has a terrific selection of free graphics to print tags etc. She also has prim backgrounds, headers and buttons. 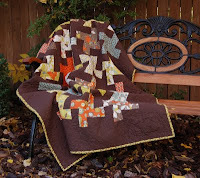 Gudrun has a quilt as you go Christmas Tree wall hanging tutorial up for grabs. I really think this would be nice to whip up for Christmas. Another must do I think. This is the first in a series of daily freebies called 12 Days of Christmas from different blogs. Take a look at Creative Studio. One Red Robin has a cute Owl to make for that special Owl Lover....and oohhh so cute. Scatter Sunshine Scrappy Quilt is a lovely easy scrappy quilt to put together using up all those scraps we seem to keep for that "one day" project. Thanks to Brown Paper Packages blogspot for sharing. Sweet Sixteen can be found over at Popular Patchwork....it is made from charm squares..you can alter the size of the charm squares to make the bag smaller or larger. Popular Patchwork has a nice sewing kit called the Simple Sewing Companion. Primitives By The Light of the Moon have primitive sampler stitchery to sew using any of your favourite stitching methods. Moda Bake Shop has a new bag up that I really like. Its called the Boutique Shopper. 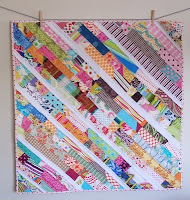 Its using the Moda Layer Cakes but you could just cut the blocks 10" square.